For every time we angst over our monthly payments, these little numbers made up it. A flower comprised of the Little L's hand and footprints complete with a cute poem, a canvas bag featuring more of the same from the big and a heart made of buttons with the badge of honor we mommas crave. 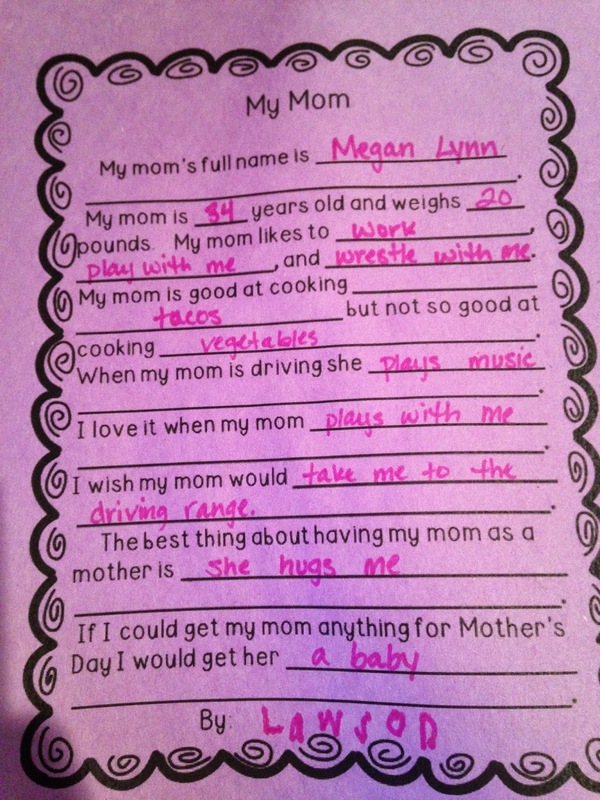 Now let's digest the purple document that's a pre-schooler's form of MadLibs, shall we? 1. I'm impressed he can recall my middle name. 2. Love that we went over my age on my recent birthday so I don't have to feel shame. That whole weight thing could use a zero after it, but who's counting? 3. My stomach did a tiny flip that he listed that I like to work as his first thought when asked what I like, but the fact that playing and wrestling outnumber this response makes me smile. Plus he could mean "work on being a mom" or "work on a marriage" or "work on the house"...what, no? Sigh. Knowing he gets his momma is working to make a difference with children's hospitals though I see as a definite plus and hope he does too. 4. The taco vs. vegetable comment? Accurate. True. And so, so shameful. Dr. D would be disappointed. 5. I'm grateful he picked up that I play music while driving vs. cursing or waving my arms in distress. Now if he repeated some of the words he hears on said radio at times...eesh. 6. The driving range comments mean guilt for this BoyMom. I used to take him every month before Little L arrived. Now penned in for next week. 7. Hugs - check. I will do it forever. A mother's mantle. Full of truth, love and happiness. More to come on Mother's Day soon and wishing you and yours one you'll always cherish!